Aspects Fancy Swirl Tray, 10" dia. Add a stylish accent and extra perching room to your existing tube feeder with the Aspects Fancy Swirl Tray. Attaching a tray to a tube feeder helps capture tossed seed, and also invites cardinals and grosbeaks to rest and dine simultaneously. This 10" diameter disc connects to your existing Aspects tube feeder (not included) with a threaded base in moments using the included threaded plug. A decorative, metal finial completes the assembly, and raised lines in a swirling pattern throughout the disc add a dynamic hint to the piece. Drainage holes throughout this unit ensure seed stays dry and water does not accumulate, and the tray may be removed in moments for cleaning. Its durable, polycarbonate body offers seasons of faithful service, and remains clear for easy seed monitoring. Help your bird sanctuary stay tidy with this Fancy Swirl Tray. Lifetime guarantee. Made in the USA. Note: This description refers only to the Aspects Fancy Swirl Tray. 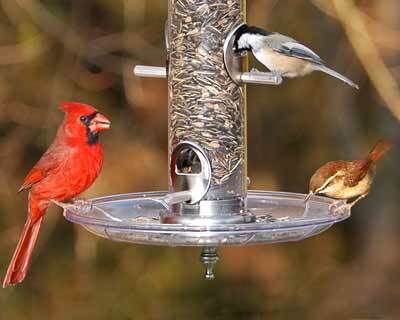 The feeder shown is not included. Aspects Round Seed Tray, 8.5" dia. Aspects Bigfoot Seed Tray for Quick-Clean Feeders, 12" dia.